The weather has been dry but rather cold and I agreed to go with Charlotte for a brisk walk along the promenade for a bit of light exercise. It seemed a good idea at the time. What I didn’t bargain for was the bitter wind which constantly kept whipping my hair into my face and making it cling there, no sooner had I wrestled a strand back than another escaped lashing itself across my face. We decided to turn around and walk the other way and into the path of the local fisherman, who every Thursday and Saturday sets up his van on a wide bit of pavement by the sea wall and sells his catch. I am sorry to say I am not a regular customer because I have a husband who likes fish but not the bones. He has a fear of getting one stuck in his throat. Which is a shame as I love fish. Luckily, he was busy serving another customer so I got to cast my eye over his offerings (no pun intended). The fish looked fabulous and I made a impulse decision that today was the day I was going to buy. When it was my turn to be served, having decided to go adventurous, the moment he asked me what I wanted, all I could hear myself say was ‘have you got any whole cod?’ It was too late I had said it, at least I knew Tom would eat it. Over the years I have devised recipes that takes away the chances of him finding a bone. Yet, if there is a bone to be found it always ends up on his plate. 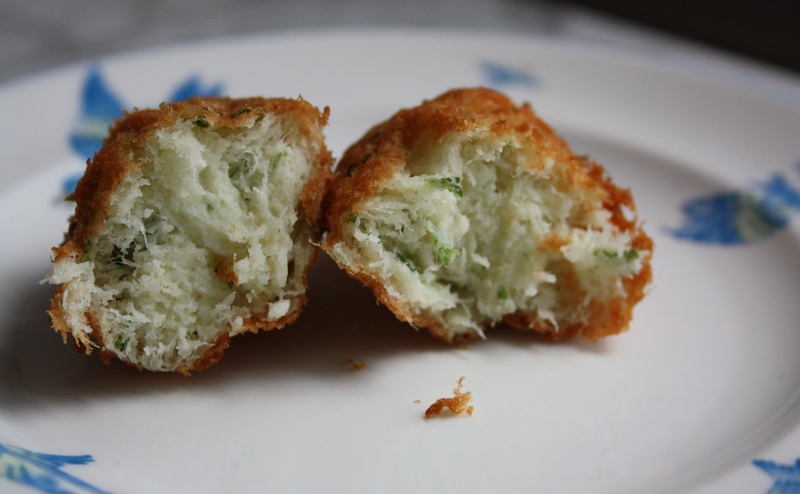 This recipe is based on the Portuguese recipe Bolinho de Bacalhua which uses salt cod instead of fresh. 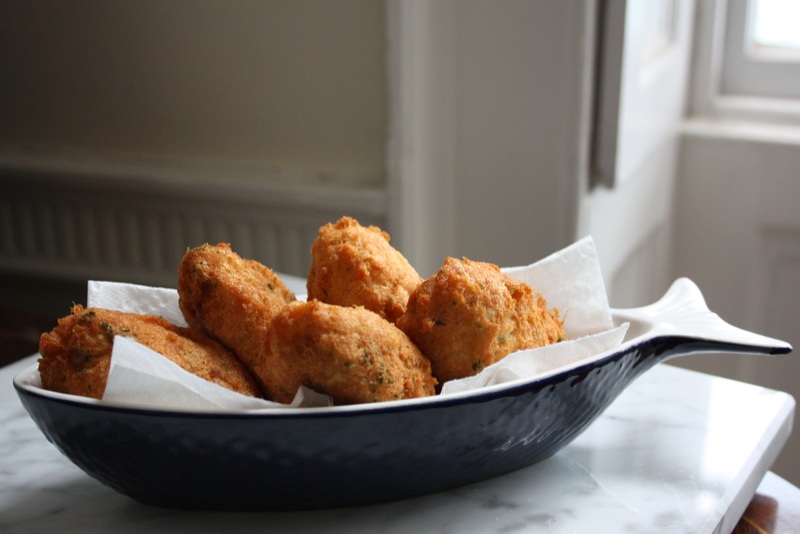 The flavour might not be as strong but these little fish croquettes have a lovely crispy outside and a soft light fluffy inside. Place the cod into a saucepan and fill with water just covering the fish and bring to the boil, as soon as it starts to boil switch off the heat with lid on and leave for 5 minutes. Drain the fish and let to cool before flaking the fish, taking out any bones and removing any skin. Set aside. In another saucepan boil the peeled potatoes until tender and drain, leave to stand for five minutes in a colander so that any water has a chance to evaporate. Put the boiled potatoes through a ricer or press through a wire sieve. You could use a potato masher but the result is not as light. When cooled add the 2 egg yolks and set aside. In a frying pan put 1 tablespoon oil and gently fry the onion adding the garlic and fry until translucent but not browned. Now add the fish and stir through. Remove from the heat. Add to this the parsley and season with salt and pepper. Stir well, incorporating all the ingredients evenly. In a clean bowl whip the egg whites with an electric mixer until soft peaks form. Add this a third at a time to the fish mixture. Gently folding in making sure that it is well combined. Add a little more egg white and fold in until all the egg white is used. Put this mixture into the fridge and leave for 30 mins or longer. This will allow the mixture to chill and make it much easier to handle. Remove from the fridge and roll into small balls or make quenelles with two spoons, take a heaped spoon of mixture and with the other spoon firmly push the mixture off, repeating this a couple of times until you have a smooth quenelle. To fry fill a pan with at least 2 inchs of sunflower oil. The oil is ready when a tiny bit of fish mixture is dropped into the hot oil and it floats to the top. Gently drop into the oil the quenelles. (I found that I could cook 3 quenelles at a time). Turn them over regularly so that they have a even colour. Once golden brown drain and place on kitchen paper put the next batch in and while they are frying place the cooked quenelles in the oven to keep warm. Gas mark 3. I just discovered your blog via Flora’s Table and then I saw this recipe of yours!!! My last holidays were spent in Lisbon, and I ate ALOT of salt cod, and loved it! These fish balls look perfect! Well, as you discovered mine, I discovered yours. I am now busy reading your fabulous entries. Thank you for your kind comment.